If you've been on an Azamara cruise before, you know we love to spoil you. Frothy coffees, delectable desserts, mouth-watering steak and exotic international buffets - dining onboard our ships is "AzAmazing"! If you're a real foodie, you'll also want to partake in some of our culinary-themed, exclusive Cruise Global, Meet Local tours. With these five handy tips for keeping fit on your cruise, you can feel good about your vacation indulgences! 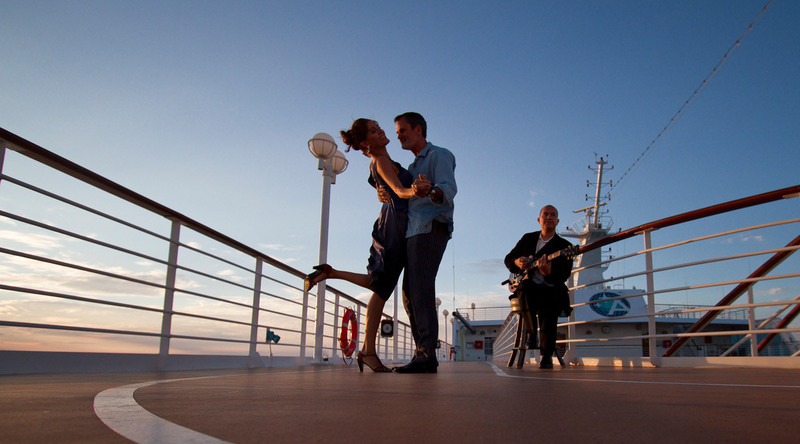 Our longer stays in port gives guests plenty of time to explore. Walking around a new city is a great workout and the best way to get a feel for the place. Don't forget to pack a comfortable pair of shoes! Head up to Deck Ten on the Azamara Journey or Azamara Quest, and you'll find a jogging track perfect for a walk or run. Take in the fresh sea air and beautiful views as you make your laps. Don't forget to stay hydrated! Bottled water is complimentary onboard our ships. Fitness classes are a fun way to relax and burn calories, and we have something for everyone. Take advantage of complimentary classes like pilates, cycling, sunset yoga or dance lessons. For an additional cost, you could even partake in a session with one of our fantastic personal trainers! Eating healthy doesn't have to be a sacrifice. At Discoveries Restaurant, there's a delicious healthy option every day, making it easy to make a more health-conscious choice. Who says exercise can't be fun? You'll definitely want to pack your dancing shoes for our famous White Night parties, which feature a poolside buffet (weather permitting), boutique wines on the house, and music from a live band.